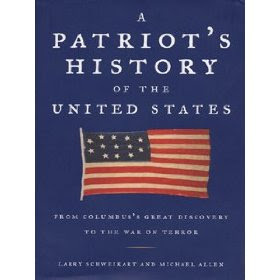 A Patriot's History of the United States weighs in at a hefty 825 pages and none of those pages constitute anything remotely close to light and fluffy reading. Entertaining and informative reading, but not light and fluffy. I originally started this post as a Reader's Diary but that was getting too long (because I spent a good month and a half on it!) so I'm attempting to condense my thoughts to something in the 249 page range instead of 825. Are you grateful yet? History, I do realize seems to be a rather "dry" subject for a lot of people. I can't say the same is true for me but I'll try to make this review at least a tad bit more interesting for those who might be of the former opinion. History, to me, is filled with passion. Or maybe I'm filled with a passion for it, I don't know. To me, history isn't dead. On the contrary - it's alive and breathing a huge story of what God has done and is doing in the world. Instead of finding Him absent, I find Him to be very much on the scene. He intricately weaves so many lives together that picking up a history book is like reading a well-written novel full of the best developed characters set within the most exciting plot(s). The dates and locations pinpoint specific and notable movements of a grand design and I think it's absolutely beautiful to behold. Reading history drives me to worship the writer of it. Does that not make sense to you? Think of it this way - people praise Dickens (although I myself still cannot seem to comprehend why) or Dumas as writing these masterpieces. We revel in their stories and delight in their imagination. Yet that's just fiction. Those authors write because God gave them the gift and ability to "mimic" Him, if you will, in writing personal histories of characters we love to know and feel a part of. History is that times a hundred million for me. I'm filled with awe and wonder at how God puts everything together. It's amazing to me to see how one individual person with one thought is so frequently the person that God uses to change a society and culture. Highly motivated individuals have changed the world. And if God has used individuals in the past, there's no reason to believe that He won't continue using them. I, being one such individual, am completely spell bound by the idea that He could use me (or anyone else that I happen to know!) just as easily. In short - every person matters and I see that when I read history. While I find history to be exhilarating, I also find it to be downright terrifying. Not only is history beautifully told and lived but it is also full of suspense. Ideas that people have can change a world. What ideas circulate in our present culture that have the ability to do the same thing? Thoughts AND actions have consequences and it's interesting to note them and see how things play out. And so I come to A Patriot's History of the United States . The phrase "awe and wonder" can only take me so far. What God has done all over the world is incredible but watching how this nation came to be is something that blows my little Patriotic American mind. Do I recommend this book? Well, let's see . . . I wondered when I began how conservative this book would be. It's recommended in conservative circles. A Rush Limbaugh interview with the author constitutes the forward in the most recent edition of this book. People who lean right must therefore love it, right? It's almost required. I've read a good number of conservative history books in my day and value and appreciate them. However, I get tired of the arguments back and forth. If you look to the far left, America's Founding Fathers are ugly cads, shrewd and devious and just as flawed as we are today. Look to the far right and our Founding Fathers are purported to be almost without sin. Both sides are fighting to be proved correct. Yet is it possible that neither of them are? The first half of the book seems to show the authors to be unbiased from a political standpoint. Schweickart and Allen aren't so much concerned with who is right and who is wrong. Just the facts, ma'am, just the facts! I felt like I was reading a neutral history for the first time ever (and I almost didn't know what to do with that)! On the one hand, my Founding Fathers aren't holy. At the same time, they maintain a degree of admirability. I appreciate a person having some self respect and human decency and so I find myself feeling more honest about what I believe the past to have looked like. The second half of the book makes me think that Schweickert and Allen are conservative. However, I also have to admit that I pretty much skimmed the last twenty years of American History. I was kind of surprised to discover that it made me feel almost ill reading about Presidents George Bush, Sr. through the present. Is it because I haven't liked any of the presidents since Reagan? No. That's not the case at all! But I feel sick reading about it because I'm still LIVING the direct effects of it. And I will be for some time. As part of my preparations for my recent American History exam I was watching some documentaries on 9/11. I didn't really need to. I remember it. (But I did need some fresh remembrance. I cried the rest of the evening after watching the videos.) One thing I've learned from reading this book is that the policies of one president never really go away. They have lingering effects. Seemingly unending lingering effects, whether those policies be related to immigration, slavery, industry, the welfare state, terrorism or what have you. Never think that what you do won't matter in the long run. It will. OH it will! What you say and what you do matters greatly and you might as well stop assuming that no one will notice you, care about you or have an opinion on your thoughts. A human with flaws who holds a considerably respected position in the government, who has a pivotal role to play and must be constantly making decisions and, consequently, making people angry. Washington's approval ratings were low at times. I told my husband after this past election that I hoped people didn't expect to totally love our current president at the end of his term in office. People easily forget history. They easily forget good times when presented with a hint of a bad time. They get tired of people and move on. We're an ungrateful nation and that comes to both Republicans and Democrats, Whigs, Federalists, Independents, etc. The beauty of what the Founding Fathers did is that they established a system of checks and balances and a way of putting people into positions of power which assures everyone that either political party can be replaced every two years. There is always turnover which saves and holds some ideals (while potentially destroying others). At the same time, it's the safest system of government in the world - and because it allows for seasons of change, it is also the most peaceful. I appreciate the early arguments which give us this system of government. Yet I don't appreciate it enough. If I learned anything from this book it was this: government preys off of our ignorance of the past. Sometimes I think current administrations aren't aware of the past and sometimes they get away with what they do because the people don't care about how far they have come. We make the same mistakes, people. Over and over again. Furthermore, we're doing it again! Instead of becoming aware of who we are as a people and how much we've fought for and achieved, we think only in terms of the present moment. Do I have a job? Am I getting paid enough? Do people appreciate me for who I am? Selfishness and boredom create a certain frustrating complacency. We need to know who we are. We need to know what's been fought for, won and cried over. We need to note past sacrifices and failures just like we need to remember the triumphs. History isn't dead at all because we're repeating it. That, in an of itself, keeps it alive. Now maybe 825 pages of history is a bit much but you might want to tackle this for a slow read. Again, I spent over a month with it! Was it worth my time? Most definitely. Is it worth yours? Well, if we ever want to really progress forward and make a true change and be different, then I'd suggest this is worth your time, yes. Learn something about your past. A lot of blood has been spilled and a lot of lives changed to make you who you are today. That's more real to me than it ever has been before. Wow...you have brought up so many great points to consider and think about. I would be interested in reading this book over a period of time. The thing about history is there is so much of it, it can be overwhelming on knowing where to begin and what sources to trust. I tend to follow my interests when it comes to history, so I know more about WWII-era European history than I do American history. Perhaps this book is a good place to start to fill some of the holes in my knowledge. He will be happy I will have picked it up...he's always wanting me to read "his books." Sometimes I do, sometimes I don't. I just got through reading John Adams by David McCullough, and now I'm reading a biography of Alexander Hamilton. You are so right. We do live and think in the present and forget history. I am so frustrated with current politics and events because I see our government doing things willy-nilly that will have long term consequences. And I'm not sure, and I don't think they are either, of what those consequences will be. I do tend to think some of them will be very bad. I have never thought about history in the way that you described. I loved history in high school and I love historical movies and such, but I have not spent much time on it since graduating. After reading this post I may have to reconsider and pick up this book to refresh myself. Thanks for linking to Show off your blog Saturday I really enjoyed reading your post.